One of the main features of thermoelectric device is to be able to switch from cooling to heating or from heating to cooling only by changing the current direction. Thermoesthesiometer is an example which uses this feature. This meter was developed to inspect temperature sensation of the skin. The skin has five senses to perceive touch, pressure, pain, warm and cold. When the trouble of peripheral nerve arises due to vibration disorder or diabetes, it is said that troubles such as sensory loss or obtundation appears on these senses. This means it is possible to diagnose the diseases if we can examine these troubles. There used to be a primitive method to examine the disturbance of the temperature sensation by using ice and hot water. Two test tubes separately filled up with ice and hot water were prepared and the inspection was conducted by alternately touching these two tubes to the patient's skin. This method had, however, disadvantages such as a messy job to prepare ice and hot water and difficulty to keep the same temperature every time. Then, an easy use pencil type thermoesthesiometer as shown Photo. 1 was developed by using Peltier elements. 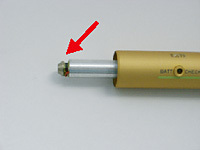 (left) By touching the red part to one of nostrils and warming there, elimination of waste products may be promoted. (right) By touching the blue part to the nostril and cooling down, the expanded pores may be shrunk. Other products which tried to utilize the features of easy switch of cooling and heating were an electronic facial equipment and an electronic cool and hot moxa cautery. The electric facial equipment was aimed to apply the warm and cool bath method locally on the face. The bath method is to improve symptoms such as swelling, stiff shoulders or cold constitution by alternately repeating the cold and the warm bathes which promotes blood circulation and activates metabolism. By applying the same mechanism, the facial equipment was developed in order to squeeze swelling of the face and regain firm skin as shown in Photo.3. Regrettably, however, the equipment could not attain to a commercialization stage. While the electronic facial equipment was to repeat heating and cooling planarly, the electronic cool and hot moxa cautery was the one to narrow the cooling and heating area to a point. It was expected that the effect could be doubled if stimulation was provided at high temperature and also at low temperature. 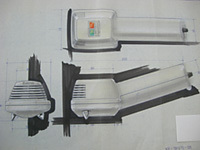 We made a prototype drawing of this equipment as Photo. 4 but the project was stopped before test production. If the effect of the stimulation at low temperature on health is made clear, there may be a possibility for the moxa cautery to revive.